If you want to know how Invision stays so bright on even the cloudiest days, look no further than our optician, Dee! Even with those expectations, Dee and the other opticians are given the freedom to do what’s best for each and every patient. “Yes there is protocol, but if I need to make a decision in changing frames, redoing a lens, maybe sometimes giving a frame to someone in need, I have that! 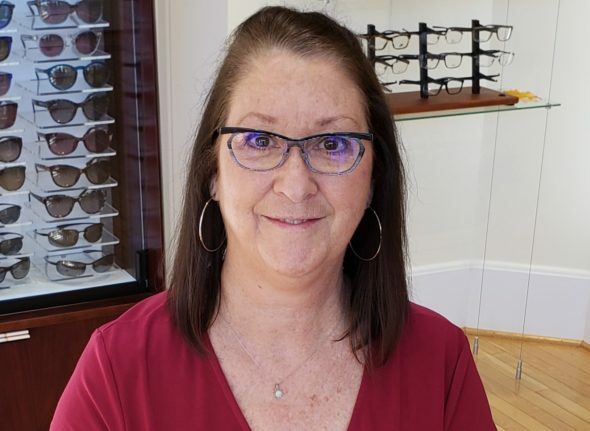 Invision has allowed me to work as if this were my business.” This allows Dee and the rest of our team to make every patient’s experience the best it can be, and helps them support everyone’s individual and unique needs. When asked about Dee, Drs. Becky & Scott Mann had this to say: “Dee is a very skilled optician, she is great at her profession. She also really connects deeply with people from the heart and takes care of our patients in a special way.” We couldn’t agree more! When Dee isn’t hard at work making our patients feel like part of our family, she’s taking care of her own! “I have 6 grandbabies. 6 prides of joy!” she exclaimed. She visits them often. She also enjoys motorcycle rides with her significant other, traveling, cooking, and crafting. Dee’s selfless nature and compassion for our patients make her a wonderful asset to our team. Thank you, Dee, for your dedication to your work and to our patients’ health & style!